Stockdale High School's Academic Decathlon coach Gaby Scully, second from the left, sits with her students at the state Academic Decathlon competition in Sacramento. While at the state Academic Decathlon competition in 2004, Gaby Scully gave birth to her son, Glen, the night before the awards ceremony. She attended the ceremony with her 12-hour-old son to watch her team win fourth place and most improved team. Glen is now a freshman at Stockdale High School. The Stockdale High School Academic Decathlon team gets into its finest and prepares to head out to Inderkum High School in Sacramento to compete in the Speech and Interview portions of the state competition. From left, Jared Carr, Emma Fox, Robert Marentes, Medha Panchal, Nicole Chang, Jann Waldo, Erik Ramirez, Caleb Carr and Daniel Liu. Caleb Carr wins a bronze medal for science (the topic was lasers) and a gold medal for his speech. Stockdale High School's Academic Decathlon coach Gaby Scully, center, holds in her excitement after the team won the Kern County Academic Decathlon in 2015. Nicole Chang, left, and Emma Fox are all smiles with their medals for being among the highest scoring students in the Academic Decathlon competition in March. From left, Emma Fox, Robert Marentes and Medha Panchal clown around while waiting for their speech and interview time slots. Emma Fox and Erik Ramirez win a medal for the Social Science category in the Academic Decathlon competition. They were tested on the history of the 1960s. The 2015 Stockdale High School Academic Decathlon team celebrates its win at the Kern County Academic Decathlon competition. 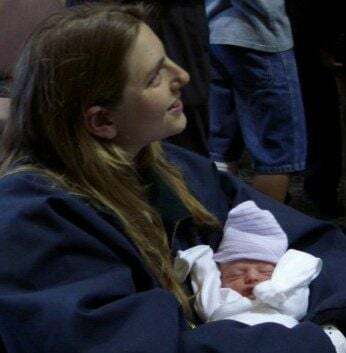 In 2004, when she was the Academic Decathlon coach at Granada Hills Charter High School in Los Angeles and 8 1/2 months pregnant, she accompanied her team to the state competition in Sacramento. "At one point I looked at my husband and said I didn’t feel 100 percent," Scully said. She gave birth to her son, Glen, the night before the awards ceremony. But even that would not keep her away from cheering on her students. "I went back to the hotel where the ceremony was, grabbed a wheelchair and they wheeled me in wearing my hospital robe with my husband’s jacket zipped up and carrying a 12-hour-old baby," she said. "We made it to fourth place and got an award for most improved team." The story gives prospective students just a glimpse of Scully's dedication. From a young age, New York native Scully knew she wanted to be a teacher. By 16, she wanted to teach science, and in college she double majored in physics and Spanish. Her first exposure to Academic Decathlon was at Granada Hills Charter where she "fell into it" after the administration asked her to teach the class. Soon afterward, she "fell in love with it." "I have this eclectic education and background. I’m not just a science teacher, I have a master’s in American studies," she said. "I’m weirdly suited for coaching something that is just as eclectic as I am." The Academic Decathlon consists of 10 subjects: art, economics, essay, interview, language and literature, math, music, science, social science and speech. Team members are well-rounded in each subject — a "jack-of-all-trades," as she puts it. She moved to Bakersfield with her husband, Bill, and two children, now three, in 2004 and started teaching science at Stockdale High School. She took a break from coaching until 2010 when then-Academic Decathlon coach Dave Brewer said he wanted to step down. "He said he would give up coaching only to someone who is as passionate about coaching as he is," Scully said. At Stockdale High School, Academic Decathlon is a club. Her team consists of nine members with three alternates. Only three members can have an A-average, three have a B-average and three have a C-average or lower. "I need kids who have literally gone through high school failing classes, but are super crazy smart," she said. "They just haven’t been successful in school because something happened, they dealt with addiction or family issues or they don’t like school." In turn, many of her students, such as team co-captain Robert Marentes and captain of the speech, interview and essay subjects Medha Panchal, find themselves improving in their classes. "Academic Decathlon showed me my capabilities, and I’m ever grateful for it," Panchal said. "I used to have a really bad reputation as a student, and this taught me I can do anything." "I don’t like school. It’s not that I don’t like learning, it’s that the system itself doesn’t work for me," Marentes explained. "But as I started Academic Decathlon and I got diagnosed with ADHD at 16, I started being able to work around it and work more with the system and started doing better." Stockdale has won the county title every year since 2013 and has gone to state 10 years in a row. Just last month as the team represented Kern County in the 40th annual California Academic Decathlon, several of her students won medals against 600 students in the state. But co-captain Emma Fox said awards do not matter to Scully. "She’s really nice and supportive, even if we don’t get a medal she tells us we’re amazing," Fox said. With all the hours of dedication she shows her team, Scully's students are there for her as well. After her husband died unexpectedly on Feb. 24, the team stood by her side. "The entire team came to visit, and they were wonderful and themselves," she said. "This group is one of the warmest and most incredible." Despite all of life's ups and downs, they are already focused on next year, and seven team members are returning. As she prepares another "powerhouse" team, it feels bittersweet. "This time next year I’ll need some emotional support (when they graduate). I will be incredibly proud as I come home to sob hysterically," she said. Editor's Note: This story has been undated to reflect Scully moved to Bakersfield in 2004. Ema Sasic can be reached at 661-395-7392. Follow her on Twitter: @ema_sasic.